Our 4-piece PA system, with which you can easily enjoy the powerful sound, is composed of an active speaker, a wireless remote control, a power cable, a wired microphone as well as a rugged speaker stand. 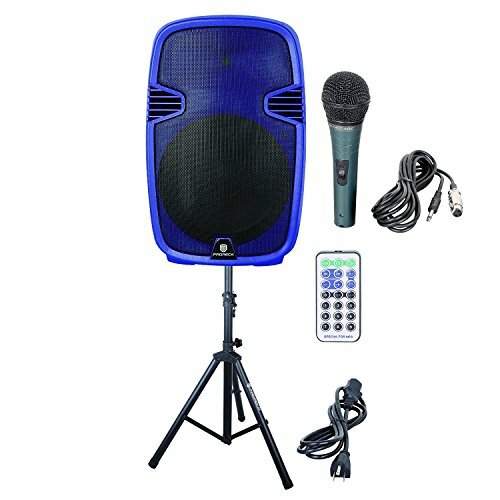 This all-in-one set is a great choice for DJ, anniversaries, backyard weddings, home studios, speech, social gatherings, etc. The PR-C15 features Bluetooth /USB/SD Card Reader/ FM Radio functions, allowing you to enjoy the versatility of this unit. More attractive, the PR-C15 has a LCD display clearly indicating the mode you choose with the wireless remote control allowing you to switch the mode when you are far away. The smooth rotary knobs enable you to easily control the MP3 and Mic volumes, with the equalizer to control the bass and treble levels. You can mount the unit to the provided speaker stand for a wonderful sound experience. In addition, the built-in LED lights with 4 colors provide a brilliant light show for your party with the unique color comfortably matching to your venue's color scheme. It is really fantastic in a party. The PR-C15 is equipped with a 1/4" Mic jack, XLR and R/L RCA inputs as well as XLR line output. This XLR line output allows you connect to an external audio device for super sound. These connecting options can fully meet all your daily demands. This 15 inch PA system with rugged ABS plastic injection enclosure has a 150 Watts RMS and 600 Watts Peak output. The package dimensions are 20" x 16" x 30" (W x D x H) with package weight of 41 lbs.